Rarely has an average, run-of-the-mill airplane attracted so much attention. But United Flight 4691 wasn’t just your routine flight from Chicago’s O’Hare to Savoy’s Willard Airport. 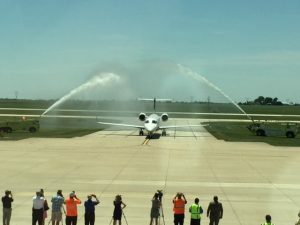 This was United’s first flight into Willard, which welcomed the airline with a soiree Thursday afternoon that attracted dozens of onlookers, including both C-U mayors. There were two ribbon-cuttings — one before the plane arrived and one after it touched down, featuring the first passenger who disembarked — a table with champagne, and a water-cannon salute over the plane as it taxied toward the gate. The flight was the culmination of a years-long objective to expand the airport’s services. Like longtime Willard tenant American Airlines, United will offer daily service to O’Hare. United departures are 5:30 a.m., 2 p.m. and 5:32 p.m. daily. Arrives from O’Hare are scheduled for 1:30 p.m., 4:58 p.m. and 9:50 p.m.